A little more than a century ago, anyone traveling 120 miles northwest of Las Vegas would have run into one of the largest cities in Nevada. With the discovery of gold in early 1905, Rhyolite had exploded. Several thousand people — mostly gold seekers, developers and miners — called it home. The city was surprisingly sophisticated, with electric lights, water mains, telephones, newspapers, a hospital, school, opera house, and even a stock exchange and public swimming pool. Today, almost all of it is gone. Its population is zero and its once envied buildings lay in ruins, a few crumbling walls towering over a vast expanse of desert. The quick history of a boom-bust town. As well developed as Rhyolite was for a turn-of-the-centrury mining town, its boom and bust was remarkably short. The boom lasted five years; its drawn-out bust took a decade. Its story started like many mining stories, with two seemingly out-of-luck prospectors giving up on the Keane Wonder Mine in California, located on the famed Funeral Range that ran down the east side of Death Valley. The partners, "Shorty" Harris and Ed Cross, were headed toward Goldfield, Nevada, stopping only to camp near Buck Springs for the night. "The next morning while Ed was cooking, I went after the burros. They were feeding on the side of a mountain near our camp, and about half a mile from the spring. I carried my pick, as all prospectors do, even when they are looking for their jacks—a man never knows just when he is going to locate pay-ore," Harris wrote in his 1930 memoir, Half A Century Chasing Rainbows. "When I reached the burros, they were right on the spot where the Bullfrog mine was afterwards located. Two hundred feet away was a ledge of rock with some copper stains on it. I walked over and broke off a piece with my pick—and gosh, I couldn’t believe my own eyes ... it seemed to me the whole mountain was made of gold." Although the two men made the discovery, they never became multi-millionaires. Harris and Cross filed a single claim, hoping all the subsequent claims would drive the claim's value higher. For the most part, it worked. They watched the town quickly grow up from dugouts and rag houses (half boards and half canvas) into dance halls and brokerage buildings. Unfortunately for Harris, however, he had a habit of letting any man interested in his claim butter him up with booze. And one night, after being especially "lit up," he went on a six-day drinking binge that ended with the sale of his claim (one he didn't remember) for $25,000. His partner, Cross, was paid five times that amount and bought a ranch in San Diego County. But Harris stayed on, living as large as the town, which quickly became larger than life. When business developers and promotors moved in, they wanted to make Rhyolite the finest city in the state. In the Harris account, the largest three-story office building was cut out of stone and the biggest of three banks was finished with bronze, marble and stained glass. The bust occurred shortly after the mining claims were formalized into mining corporations, with shares of stock rising to $23 and then dropping to less than $3. By 1908, minority shareholders opened Pandora's box by hiring a British mining engineer, who gave the mine an unfavorable rating. As soon as shares in the biggest mine fell to 75 cents, it was the beginning of the end. All of the mines began to slow or close. As they did, so did the town. The banks closed in 1910. The newspapers in 1912. The post office in 1913. The train station in 1914. And eventually, the electricity was turned off in 1916. Although Harris moved on, he never believed his discovery of the Bullfrog mine was tapped out. In his account, he says stock speculation killed the town because too many thought they could get "gold out of the pockets of suckers" faster than they could get it out of the ground. What remains on the eastern edge of Death Valley. The ghost town today mostly consists of eight crumbling structures on a ridge that overlooks the wide open desert. Most of them of are merely frames, including the three-story Cook Building, two-story school house, and the front of the Porter Brothers store. The buildings that have fared the best include the jailhouse, railroad station and the infamous Bottle House. The latter was built by Tom Kelly over just under six months, made out of Adolphus Busch bottles (better known as Budweiser) as he and his saloon patrons drank them. 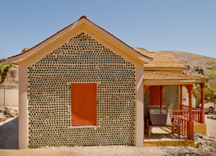 It was one of three bottle houses built in Rhyolite, but the only one to survive long enough to be preserved. It might not have have had Paramount Pictures not restored and re-roofed the home in 1925 for a movie. People also lived in it, on and off, until the 1960s. 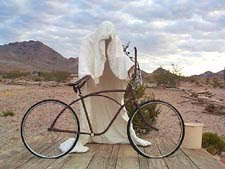 Rhyolite's other claim to fame includes the ghostly statues built by Albert Szukalski at a site now known as the Goldwell Open Air Museum. Since he first placed his Fiberglass cast statues out there, several other artists have made contributions to this odd and interesting sculpture garden in the middle of nowhere. The most famous still belongs to Szukalski, a life-sized sculpture of the Last Supper. Rhyolite, Nevada, Spooks Up 6.8 On The Liquid Hip Richter Scale. 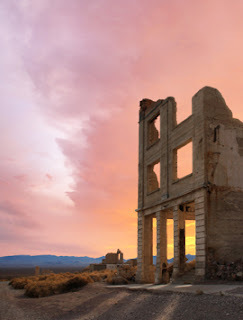 There are few accommodations anywhere near Rhyolite, with most adventurers traveling from Las Vegas to see the sculpture garden and quiet giants found there. The most common place to stop for lunch is Beatty, Nevada, which one of several towns that sprung up at the same time as Rhyolite. Beatty doe have a few small hotels and motels, serving mostly as an outpost for people exploring area ghost towns and natural wonders around Death Valley. The town boasts several historic buildings of its own and a museum dedicated to preserving the history of the Bullfrog Gold Rush, in which it played a part. Although summer is generally considered an off season, given Death Valley consistently climbs above 120 degrees, some well prepared and experienced guides provide tours from Las Vegas. People who would rather go it alone with a rental ought to plan ahead and be especially prepared. Anyone planning to stay in Las Vegas can compare prices with Fare Buzz. While Harris' memoir is nearly impossible to find, there is another out-of-print book about him on Alibris.